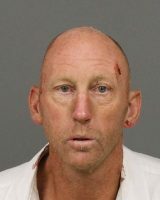 The man San Luis Obispo County Sheriff’ officials have named a person of interest in his father’s 2009 murder is currently in jail following a DUI arrest Sunday night. At about 8:20 p.m., Brian Greer, 51, was driving westbound on Creston Road east of Templeton. Greer made an unsafe turning movement, crossed into another driver’s lane and collided with the vehicle, according to the CHP. Greer, as well as two people in the other vehicle, each suffered moderate injuries and were taken to Twin Cities Community Hospital. Officers arrested Greer on charges of DUI causing bodily injury and driving with a blood alcohol level of .10 or higher and causing injury. Officers booked Greer in to the San Luis Obispo County Jail early Monday morning. As of Monday afternoon, Greer remains in custody with his bail set at $100,000. On March 28, 2009, Greer’s father, Jerry Greer, was sleeping in his Templeton home when bullets tore through his head, neck and shoulder, killing him instantly. Jerry Greer’s murder has remained unsolved. For years, Brian Greer has been a vocal critic of the sheriff’s investigation into his father’s murder and has accused detectives of failing to secure evidence at the scene. This August, detectives interviewed Brian Greer for two and a half hours. Deputies then searched his home while having him stand in his driveway in 100 degree heat, Brian Greer said. Deputies later conducted search of a property in Paso Robles that Brian Greer formerly owned. Detectives have also detained and interviewed Brian Greer’s mother, sister and ex-wife, asking several questions about family finances. Some individuals have asserted Brian Greer killed his father, while others claimed it was either teenagers or a local drug addict searching for cash Jerry Greer allegedly kept at his home. At the time of the murder, Brian Greer was a sergeant at Soledad State Prison. He has since retired at the rank of lieutenant.